What’s that bright spot near the Moon? Venus. About a week ago, Earth’s Moon appeared unusually close to the distant planet Venus, an angular coincidence known as an appulse. Similar to a conjunction, which is a coordinate term, an appulse refers more generally to when two celestial objects appear close together. This Moon and Venus appulse — once as close as 0.05 degrees — was captured rising during the early morning behind Koko crater on the island of O’ahu in Hawaii, USA. 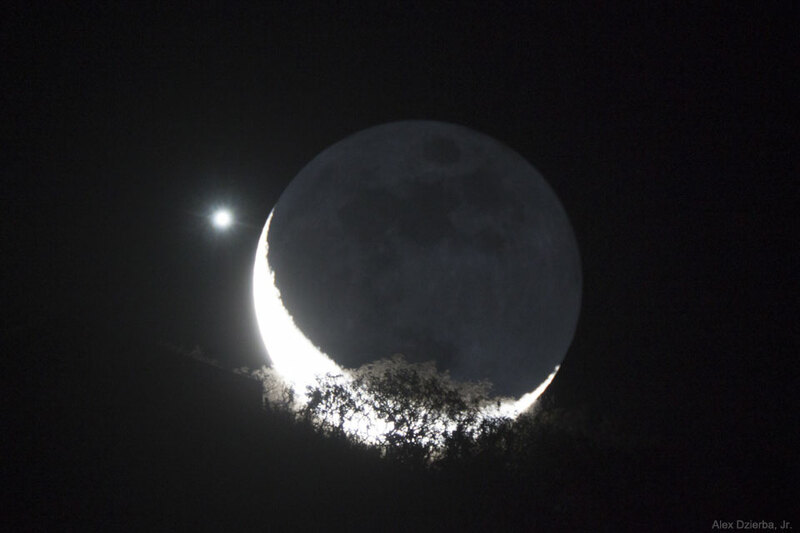 The Moon was in a crescent phase with its lower left reflecting direct sunlight, while the rest of the Moon is seen because of Earthshine, sunlight first reflected from the Earth. Some leaves and branches of a foreground kiawe tree are seen in silhouette in front of the bright crescent, while others, in front of a darker background, appear white because of forward scattering. Appulses involving the Moon typically occur several times a year: for example the Moon is expected to pass within 0.20 degrees of distant Saturn on March 1.